#anotherearthart is a feature in which we get people to tell us which artwork or fashion image they’d choose if they had to leave earth today and go to a brand new world empty of all our art. Would they choose something to comfort themselves or would they choose something to help whatever may live or come to live in this new world? At thirteen I was invited to join Vita Petersen’s life drawing group. Vita was a German expressionist, living in New York and her class was for ‘upper schoolers’. Maybe I was invited because I had joined a neighbourhood school late and someone was trying to nurture potential talents in me so that I could find my place there – whatever, it was an honour. Vita taped paper over the glass window and we drew the model, naked. One day the model couldn’t make it so Vita handed out paintings by famous artists. I got Odalisque with Raised Arms. 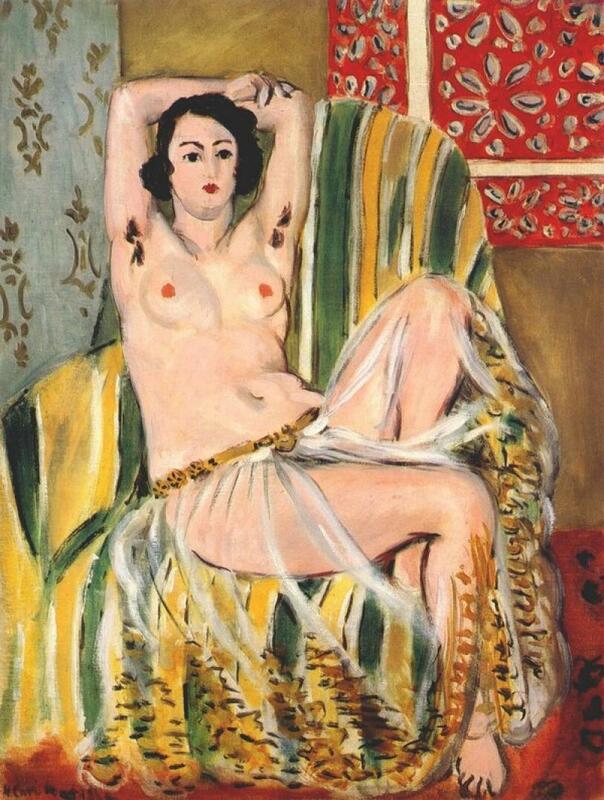 I had looked at paintings by Matisse, at the Met in books but I had never drawn one. Vita told us to turn the painting upside down and not to think about what the painting was of. She told us to mix the colours from our primaries and to think shape, stroke and color. In the end my Odalisque with raised arms was surprisingly satisfying. Vita held it up for these other 16-18 year olds to learn from. My intimate relationship with the Odalisque had begun. My next significant meeting with her was in Washington DC. I had begun a cross America bus trip in the worst snow storm to affect the East Coast in years, traveling from New York to Washington in the thick of it. A plane had crashed into the Potomac and I was at the National Gallery. Already a long day I had seen the Wooten Desks at the Smithsonian and was determined to at least get through a floor of fine art, when I turned into the Post Impressionists. As I rounded a corner, there she was, the Odalisque. And there I was overcome. Luckily there was no one else there. In fact, I wondered if they’d closed the museum with me inside. Rebecca Guyver is an artist living and working in Suffolk. She’s exhibited in three different continents and organises pop up mail art exhibitions all over the world. While working for the peace corps in the 80s she and a few friends were held up by Samburu Warriors somewhere in the Kerio Valley. I read this article and found it very interesting, thought it might be something for you. The article is called Odalisque with Raised Arms – #anotherearthart and is located at http://prancingthroughlife.com/2014/08/19/odalisque-with-raised-arms-anotherearthart/.